Being or...wellbeing? The thrill of looking out at the open water, the expansive feeling of the spaces, the relaxation of body and mind... the flybridge is like an enormous living room with two facing sofas. An elegance surpassed only by the sophisticated amenities designed to entertain and pamper the guests, with an unmistakeable touch of style. 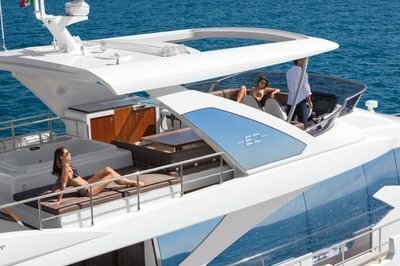 Continue reading for more information on the Azimut Flybridge 80. The future of boat design has arrived. A new approach to space layout, furnishing design, and interior lighting. Azimut 80 combines the allure of minimalism with the utmost in comfort. Large open spaces, the joy of living and entertaining. Dream Therapy. In the sleeping area, every room is filled with sophisticated elegance and charm, as you find yourself in the land of dreams. Clean lines, refined forms, concepts that foster wellbeing and promote relaxation. 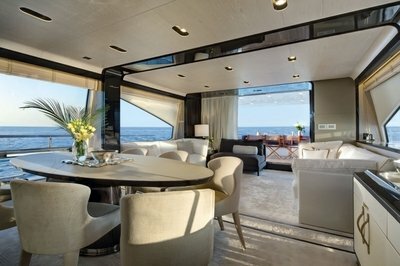 Total relaxation: the dining area with C-shaped sofa, the bow area with L-shaped sofa, the central sunbathing area with removable cushions and option for a Jacuzzi. Mini bar with sink, refrigerator, and barbecue. Sun-pad area with cup holders on the sides, built-in bow sofa with 3 lockers. 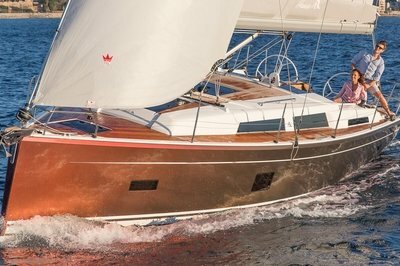 Bimini integrated in the electronically operated hard top. Option for a cover in the stern area as well. Extra comfort: mini bar in the cockpit with built-in sink, complete with barbecue, stainless steel protective plate, and safety outlet. Steering console with leather-clad instrument board. Engine and marine gear instrumentation controls with 7” display, option for 2, 15.4” touch screen displays. 7” touch screen system monitoring display. Style and function: dinette equipped with corner sofa and adjoining storage area, fixed table in wood with stainless steel inserts, and LED lighting. Maximum performance also in the kitchen: 419-litre refrigerator with 247-litre freezer, Miele microwave, and Miele induction cook top. Style in every detail: the bright airy staircase perfectly complements the design concept of sophisticated elegance.